So blogging reconvenes after my last post almost 3 months ago (aptly titled "A 3-month catch-up before blogging reconvenes"). There could be a ton of backstory here, but I'll try to make it short. It's never been a secret that I've struggled with my athletic identity following the unplanned end of my pro triathlon career 5 years ago. I tried race-walking, getting back into triathlons as an amateur (which distance? sprints? try an ironman again? probably half ironmans, then? 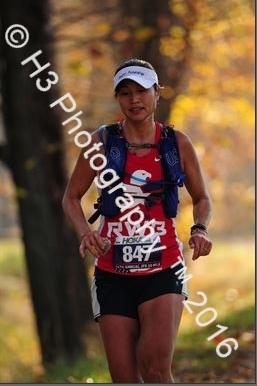 ), tried a 100km road race once "just to finish" 3+ years ago, and what about road racing...marathons? Try to get fast enough to qualify for the Olympic Marathon Trials? When I said "I have unresolved feelings about all this" regarding the 5-year anniversary of my bike vs. car crash in the last update, I decided this summer it was finally time to resolve all those feelings. Many years ago, I used to think I would be racing triathlon professionally until I was 35 or so. This week I turn 35. At the same time, I also felt incredibly selfish as a pro triathlete. It was very "me me me!" 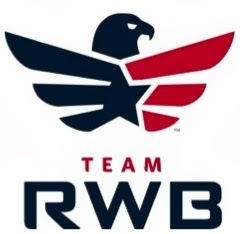 In the years since I've "retired" from triathlon, I threw myself into work, family, and volunteering with Team RWB. Maybe I was making up for all the years I felt like I was a selfish pro triathlete. This summer, I realized I had gone so far in the other direction of helping everyone else, that I needed to actually do a little more for myself. 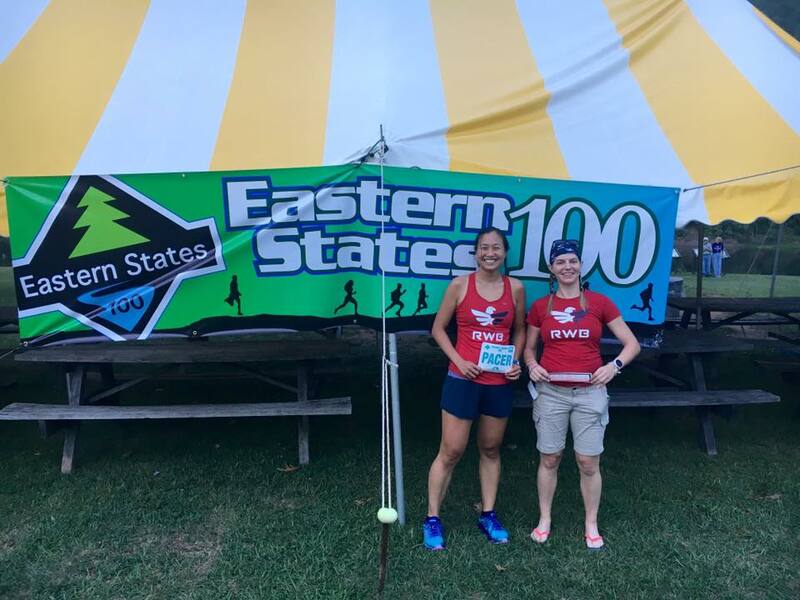 I had completed Eagleman 70.3 with hardly any training, and following that mediocre race, had trouble getting myself in the pool or on the bike in order to prepare for the Beach2Battleship 70.3. I had sworn I really wanted to take a crack at a half ironman PR before my 35th birthday. I finally had an honest look at myself in the mirror, and realized I had no more desire to train for or race a triathlon. So why was I trying to make myself do something I didn't want to do? Was it because I had done triathlons for the last 17 years and that's all I knew? Is it because it's what people expect me to do? 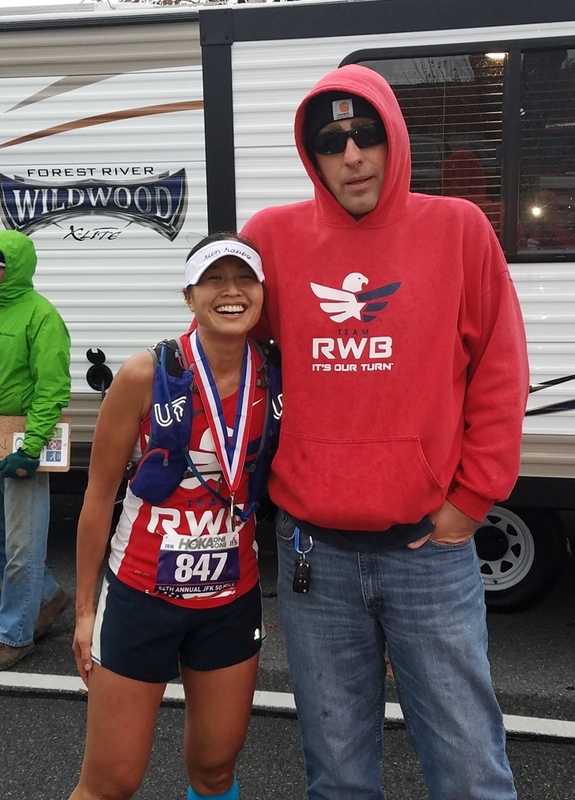 I think Eagleman made me realize I was no longer challenging myself any more, and I didn't get a feeling of accomplishment doing things I've already done, like when I was first a new triathlete. I've always been someone who "competes" rather than "completes"--if I didn't have that competitive fire in me any more to train or race well, I didn't see the point of just going through the motions. 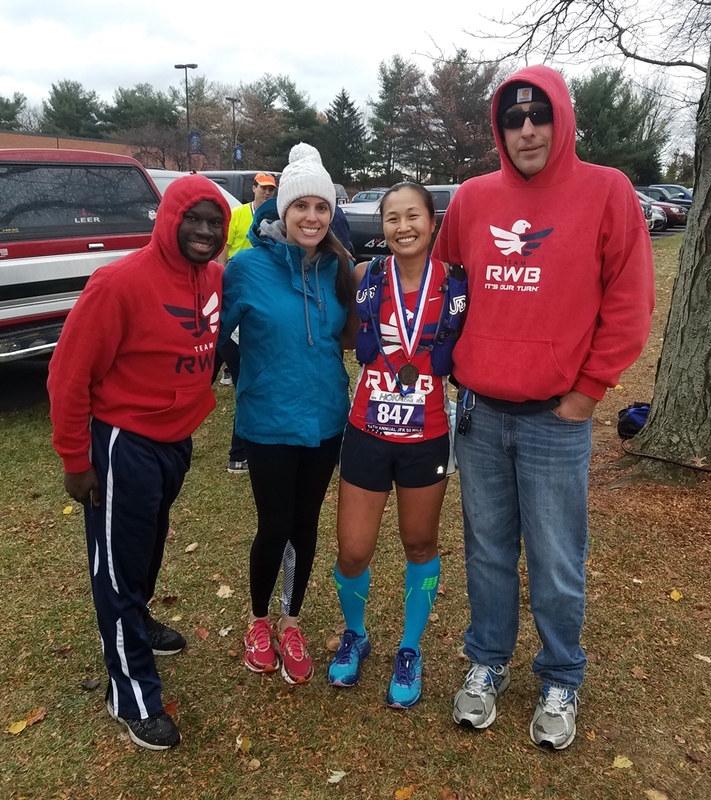 In August, I went on a road trip with Emily and Ryan (two of our first members of the Northern Delaware Team RWB chapter who have quickly become close friends). Emily was attempting her first 100-miler at the Eastern States 100, and Ryan and I were her crew team. Both of them had gotten into ultra trail running in the past year and I kept thinking "that's too crazy for me". I was planning to train for my first Boston Marathon next April, until ES100. Within a week later, I had my first pair of REAL trail running shoes (Saucony Peregrines) and bought an Ultimate Direction Ultra Vesta (like a Camelbak with more pockets!). 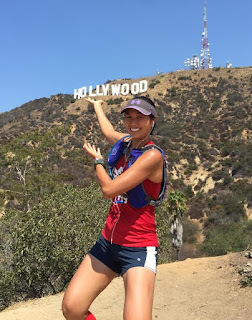 At the end of August, I went home to visit my family, and took my new pack on a running adventure from my sister's new house in Koreatown (Los Angeles) up to the Hollywood Sign and Batcave. I remembered how much I enjoyed going on "monster runs" with my trusty Camelbak when I trained under Sutto, and how much I enjoyed exploring trails in my college to pre-Sutto years (he was adamant we shouldn't train on trails as he didn't want us spraining ankles). 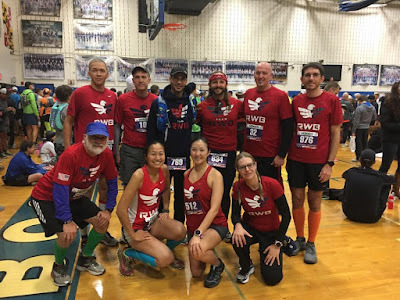 I wanted to race the JFK 50-miler as I had heard many good things about it from other Team RWB friends, it was only 2 hours away from us in Delaware (and only 1 hour from our DC friends), AND it is known to host a very competitive field--there is prize money for the top 6. (See my note above about competing vs. completing.) So...even though my trail running experience was extremely limited and I hadn't ever raced this long of a distance, I signed up and set my sights high. I realized that there was no 30-34 or 35-39 age group--if you are not 19 & under or 40+, you get lumped into the "open category" AKA 20-39. And there would only be trophies for the top 10. I looked back at old results and it seemed that the top 10 women typically finish right around the 8-hour mark. So I aimed for the top! My A goal was to get into the top 10 with a sub-8 finish. 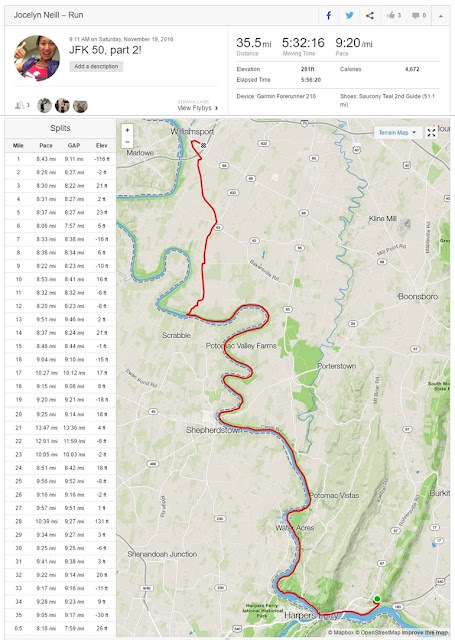 I planned out my race strategy, which included holding 10:20/mile pace on the tricky Appalachian Trail section (the first 15.5 miles), settling down to 8:45/mile on the flat C&O Canal Towpath section (the next 26.3 miles), and bringing it down to 8:30/mile for the final 8.4 miles on the roads back. 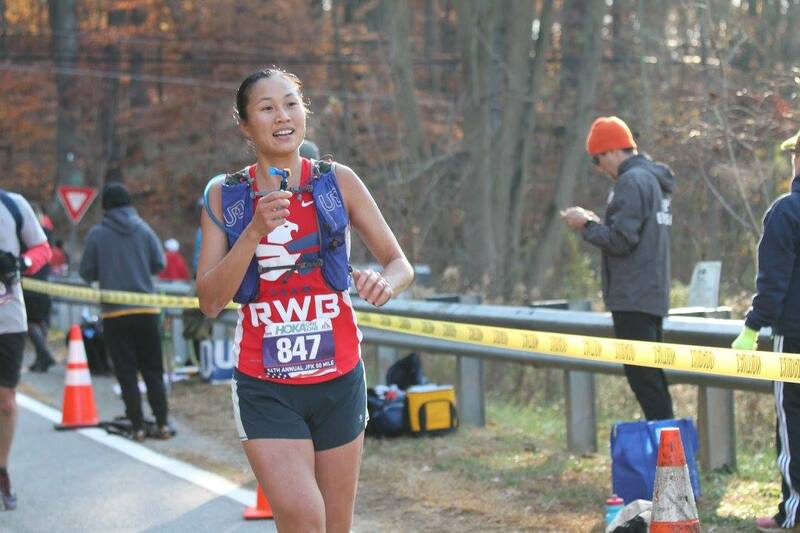 I even allowed "transition times" (5-8 minutes) for when I saw my support crew at miles 15, 27.3, and 38.7. Following that plan would get me right to 7:59:59! Most of all, I needed to do something for me. I hadn't felt like "my old self" in a while, and the past few months have felt like I have been getting back to that person. Unfortunately I didn't have B or C goals, because I honestly didn't know what to expect. I wasn't sure how fast I could really take the Appalachian Trail section, and my main goal for that part was "NO CATASTROPHIC FALLS!" I've known people that have fallen on the latter part of the AT and needed (or should've gotten) stitches. My other goal was "stay mentally strong throughout 8-ish hours." 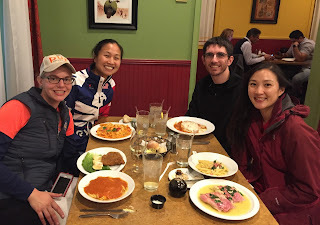 Pre-race, I rode down to Hagerstown on Friday with Ryan (also first time racing a 50) and Emily (crewing for Ryan), and we met up with Stacy from the DC chapter who was also doing her first 50. 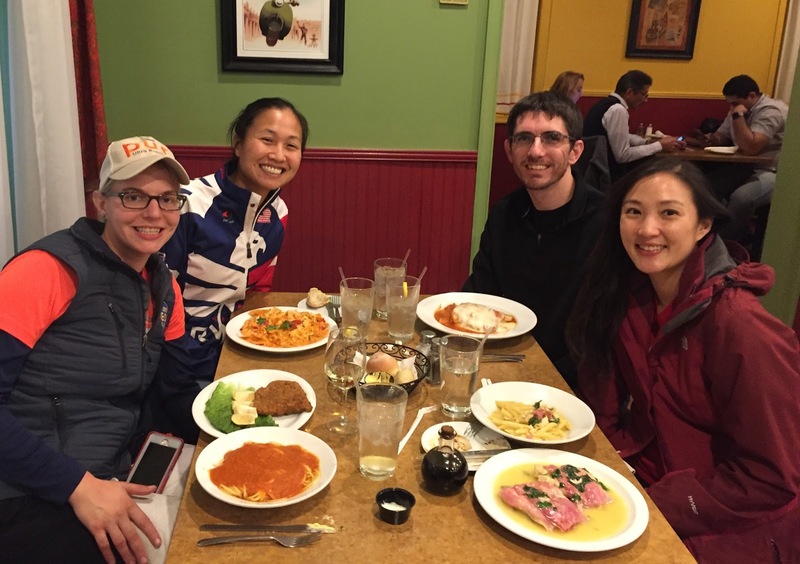 We went to packet pick-up and stuffed ourselves with dinner at Carmine's Italian, which was amazing. Race morning was great as I had not just one, but two lucky morning poo's! (You definitely don't want to have to "go" during the race.) Also, out of the 1,000 or so runners, only 20% were women so we had a super short bathroom line compared to the guys. It reminded me of my very early days in triathlon (these days there are definitely more women than when I started). We also organized an impromptu Team RWB pre-race photo with random members from other chapters. Okay! Shut up! When does the race part of the race report start already?! After probably our 4th pee break in the Boonsboro High School gym, Stacy and I jogged among the masses to the start line. After cheering for Will in Charlotte back in July, he returned the favor by popping out of his car right by the start line to give me the best ever surprise "good luck" hug, and then we were off! The start time was 6:30am, so it was already civil daylight and we didn't need headlamps. I had also been stoked about the weather forecasts, as it's a late November race. We got a balmy 48*F at the start, and it was projected to get up to 62* with a small chance of rain after 2pm. I didn't even need armwarmers! 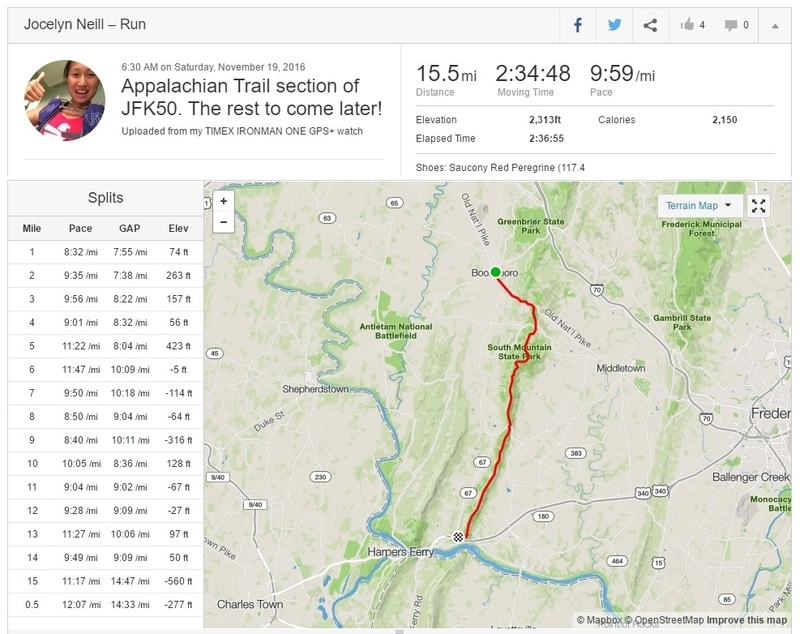 I had studied various course maps, and read a ton of race reports online. I knew to hold a steady but not slow pace (when I go slow and easy on trails, it's more like 12- to 13-min pace, and I needed to average 10:20's!). Since I started pretty close to the front, a ton of people still passed by, some women breathing pretty hard up those first 6 miles, and I did my best to hold back and not get too excited. Will also managed to pop up in some secret cheering spots (about miles 2.5 and 9?) which was pretty cool! Once we hit the peak at 6 miles, it was a nice net descent for the next 10 miles. Other than the 50-mile distance, the X-factor for this race was the AT section; I figured it was like the swim in a triathlon--you can't win the race in the swim, but you can definitely lose it in the swim. I didn't want to go too easy here if I wanted to take a crack at the top 10, but I didn't want to go so fast that I would fall and bash my head on a sharp rock! I had a few mantras including "don't get complacent" and "be a little reckless." 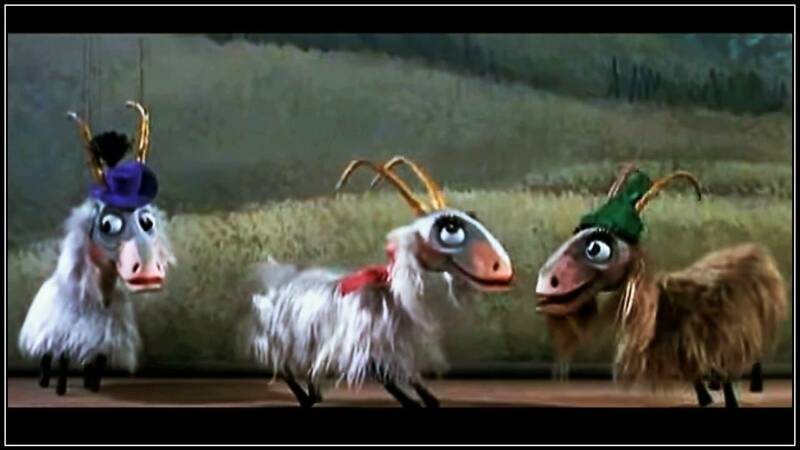 Also "pick up your feet" and "be a mountain goat!" I had been practicing running on more technical trails about once a week at White Clay Creek State Park, and would always jump onto the man-made mountain bike obstacles to practice my footing. I found this fancy footwork to actually pay off, as I was told from an early age that I was a klutz. (My high school running coach never let me race the hurdles because I once tripped on a speed bump in a cross country race, and that was that.) I had also previously dabbled in shorter trail races and always found myself to be stumbling and tripping a little too frequently. I decided earlier this summer that trail running without falling (or stumbling too much) was an acquired skill, and had made myself practice because...what did we want? NO CATASTROPHIC FALLS! 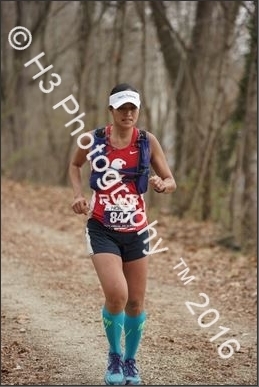 During the race, I realized I was a better downhill trail runner than I gave myself credit for. Because I wasn't being complacent, and being a slightly reckless mountain goat, I found myself passing a good number of runners on the way down the big hill. 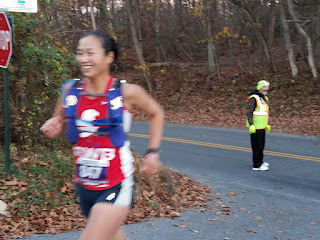 Okay, I did have a stumble-stumble-stumble-caught-myself moment when I realized I caught up to the woman in 10th place, in which case I had to check myself before I wrecked myself. So I told myself to chill out! No catastrophic falls! I found that if I led with my left leg, I felt more secure. (Even though I am right-hand dominant, I had an old college hip injury on the right side, which has thus always been tighter.) The very last few miles are on super steep switchbacks, which I had heard about, but never experienced. I was still surprised at how steep it was, with very sharp narrow rocks; I felt like I had to hop from rock to rock in some areas. 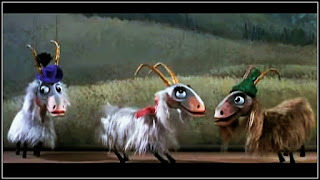 ALSO...because I was such a great mountain goat, I had that lovely song from Sound of Music stuck in my head... "High on the hill was a lonely goatherd..." so I had some yodeling to help me get through that section. HAHA! Soon enough, I heard cheering from the bottom of the hill, and ran through a whole tunnel of cheering spectators! I then heard my name and realized I had passed my crew, Emily and Caitlin. I ran back about 10 steps and gave Caitlin (and Baby Brown) a huge hug! Caitlin was one of my first and best friends from Bethesda and offered to sherpa this race when she learned that Kevin had a morning obligation in Delaware and would only make it to the finish line. 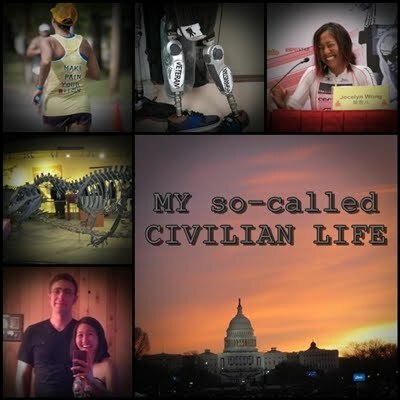 (Triathletes say "sherpa" and ultra people say "crew"!) I was there 10 minutes earlier than expected, and only needed to switch from my trail runners to my more cushioned road shoes (Saucony Guide 9's), switch GPS watches (as the two I have do not last longer than 4 or 5 hours apiece), and throw more gels in my pack. And really, just for hugs, smile, and moral support! I was feeling good, and off I went again! Caitlin had mentioned I was over 10 minutes ahead of pace, so all I had to do was follow the plan. The plan called for averaging 8:45 miles for the next 26.3 miles. 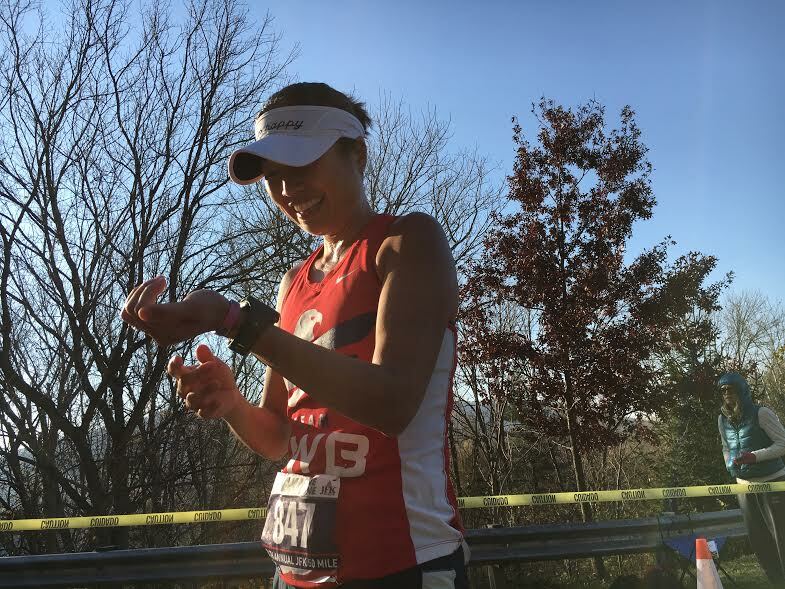 I held myself back from "comfortably uncomfortable" pace (too fast!) and found myself "fairly comfortable" anywhere between 8:15's to 8:30's. 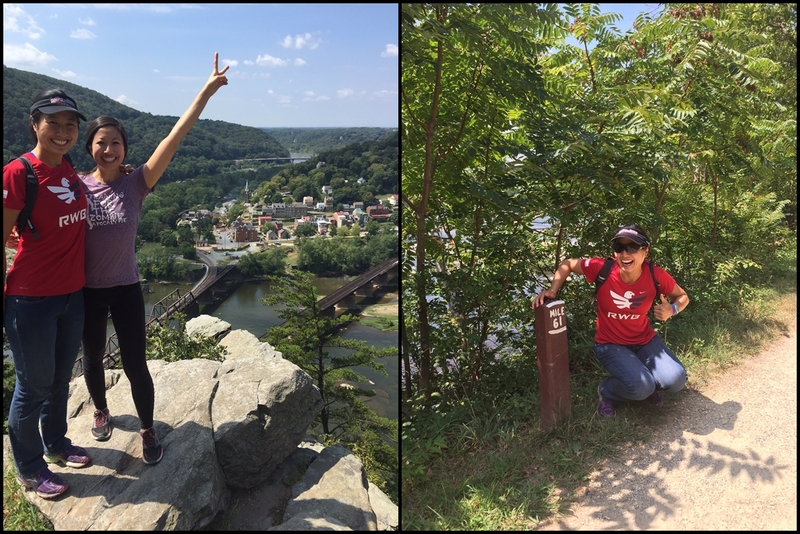 There was a really cool part where we ran through Harper's Ferry, West Virginia, and I realized it was the same exact place I had been to with my sister last summer during my bachelorette weekend. We had hiked this exact section of the towpath! 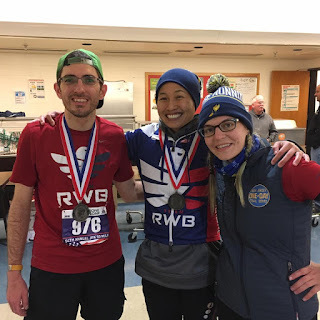 The towpath was emptier than I expected, as I'm used to more crowded road races (and REALLY CLAUSTROPHOBIC TRIATHLONS), and had figured that over 1,000 runners would mean I'd be running with other people. I guess the Appalachian Trail really breaks up the crowd! 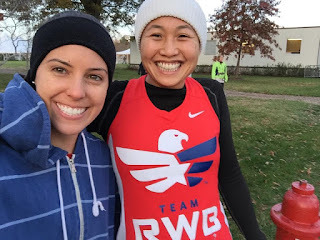 I slowly reeled runners in, and about 10 miles into the towpath, I found myself catching faster women here and there, and counted myself up to 8th place?! (Random spectators would let us know what place I was in the women's field.) I was excited and a little confused. No way could I be up this high already! 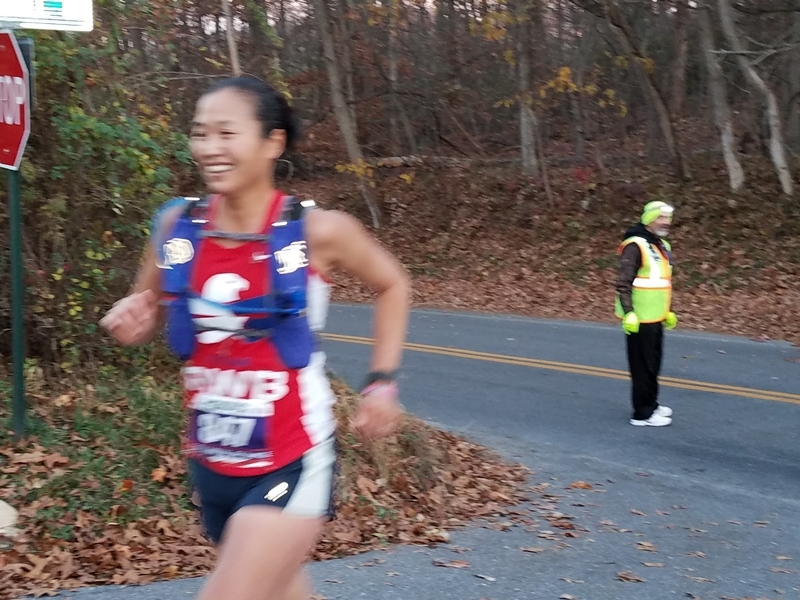 I saw Sherpa Caitlin a couple miles later at the mile 27.3 stop (Antietam). "Oh my gosh, I think I'm in the top 10!" I told her. She affirmed it, although at the moment I stopped there I was actually in 9th, and then got passed by 10th. It was really cool to be close to several strong women in the race! I didn't need to refill my hydration pack as it still had plenty of fluid (OH NO FORESHADOWING) and I was tired of eating gels 4.5 hours into running, so I just grabbed my ziploc bag of potato chips. Caitlin told me I was still about 10 minutes ahead of my race plan. I just needed to keep doing what I was doing! I jogged a little bit while trying to eat my chips, but it's very hard eating chips while running. I took a short walking break to force them down, as I had stopped eating my gels probably an hour ago, and knew I needed to keep fueling. Unfortunately when it was time to start running again, my legs did not want to go any more! This was around mile 31-32. It's like my legs knew my longest runs in practice had been 50k (31 miles), which I had done twice--once in a race situation (Blues Cruise 50k) and a few weeks later as a training run--and wanted to be done already. My quads were locking up, like a really tight crampy sensation. Actually, it felt eerily similar to racing a triathlon, when you go way too hard on the bike on a flat course when you are not fit enough, and then try to run. Okay, maybe I had gone a little hard on the downhills on the Appalachian trail. Okay, maybe I should've been drinking more and was low on electrolytes too. Okay, maybe this 50-mile stuff is even harder than I expected! I did not eat all these gels. I tried to do some math in my head, which is actually kind of tricky when you are 5 hours into a race, more dehydrated than you'd like to admit, started your second GPS watch at mile 15.5, and there are mile markers on the C&O towpath that are in the 60's-70's. All things considered, I realized I had about 3 hours (180 minutes) to go 18 miles, in order to get my 8-hour finish. Which is only 10-minute miles. Totally doable, right?! But the quad seizing forced me to walk, and as runners started to pass me, some offered words of encouragement. One fellow in a "wear blue to remember" shirt, told me to try shuffling like him. Okay, I figured, I've done the Ironman shuffle many times, I can do this! I was able to shuffle about 10 steps and then my quads would lock up. NOOOOO. I alternated walking with shuffling until even trying to walk caused my legs to cramp. NOOOOOOO. Why is my body failing me now?! I got pretty discouraged as I kept getting passed and felt my race slip away. When I finally got to the mile 34 aid station, it was called "Miracle on 34th" and had a Christmas theme. Someone was even dressed up like Santa Claus and there were Christmas cookies! But I didn't feel like eating anything. I started drinking Coke though. Coke is always good for race emergencies. I asked Santa for a hug, and then said "Santa, for Christmas this year, I want to finish this race." He replied "Ho ho ho! I'll grant you your Christmas wish! You will finish this race today!" I sat down for a little bit while Caitlin riffled through the crate and pulled out the jar of pickles I put in as an afterthought. She has just started her 3rd trimester (first time mom!) and made a joke about "who's the pregnant one here?!" Emergency pickles were not as delicious as I thought they would be (yech!) 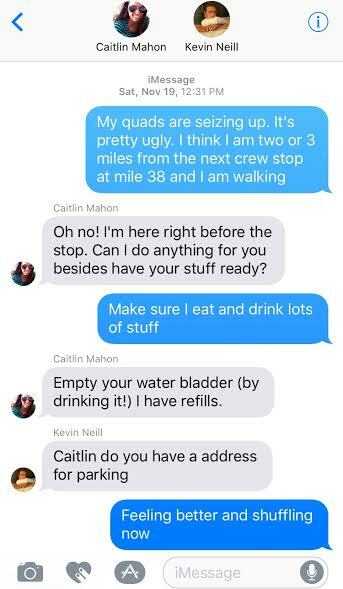 so Caitlin suggested she run with me through the actual aid station which was about 100 yards down. Since I could only run 10-minute miles, apparently that is Caitlin's pregnant running pace so we ran together through that next aid station. She stuffed a bunch of pretzels into my vest pockets and gave me strict instructions to eat them and drink from my pack. I had to pee, but the porta potties were across the street and involved going down a short steep downhill before crossing. I looked down the hill and my quads started taunting me, so I decided it was time to keep going and hit up a porta potty that didn't require a downhill to get to it. Caitlin ran me out of the aid station and my legs were feeling good enough that I told her to estimate me at 10-minute pace to get to the finish line. I petted more dogs, and then was able to shuffle through the last 5k of the towpath, although I broke my promise to Caitlin about eating all the pretzels. I really tried! They just became a dry mush in my mouth... I finally hit the last timing mat at mile 41.8, the end of the towpath, in an elapsed time of 7 hours and 17 minutes. Of course I didn't know it then because I was done trying to use my dwindling math skills. Looking back, that was almost 30 minutes behind my original plan, so I had managed to lose another 20 minutes after hitting the final crew stop. I probably needed it at the time, for both my mental and physical sanity, but for a future note-to-self (OMG YES I AM THINKING OF DOING THIS RACE AGAIN!) --I'll try to limit my stops! Oh, and spoiler alert--I would end up finishing about 23 minutes off the top 10 podium! We then got thrown on the road. 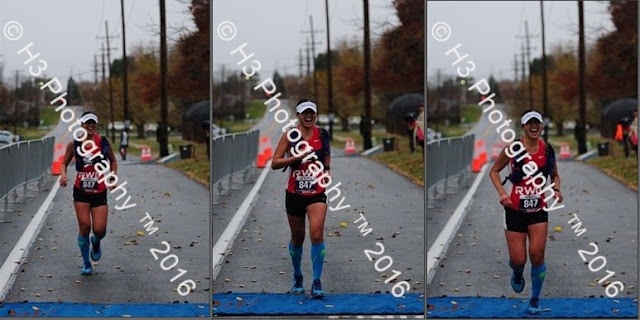 I had done all my race report research in the months leading up to the race, so I remembered there would be mild "rolling hills" with mile markers counting down from 8 to go. I have never been so happy to see single digit numbers! At this point, my legs were working again without locking up, and I was able to get the 10-minute shuffle going. Caitlin had texted Kevin an estimated time of arrival at the finish line at 3:10pm, which was a 8:40 finishing time. As each mile marker ticked by, I would check the time of day on my watch (since I didn't have an accurate cumulative time), and I was spot on to finish at 3:10. Not going much faster, or slower. But in the back of my mind, I kept thinking I had to squeeze out a few seconds faster somewhere! How much faster does 8-thirty-something sound than 8-forty? Right guys?! Yeah, the mind was willing, and the legs were going as fast as they could. Actually, they were going much faster than throughout miles 30-40 as I actually began to catch several guys in front of me, who were walking or shuffling slower than I was. (Strava tells me these were more like 9:30 miles, which is only 1min/mile slower than my original plan.) We cheered for each other, and a few of them remembered me as the girl who was holding onto a tree on the side of the towpath earlier. "You came back to life!" 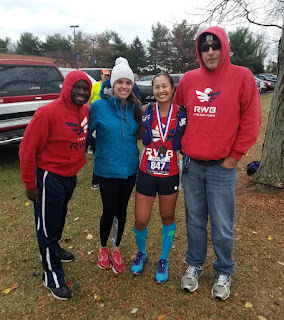 Those last 8 miles, my body went on autopilot; I barely ate or drank anything because at that point, I knew I was going to make it, and nothing was going to stop me from getting to that finish line. The gorgeous weather had also turned sour when we got onto the roads--it became extremely gray, windy, and gusty with light cold rain in the final miles. Kevin told me later there were 30mph winds with 50mph gusts. I didn't need arm warmers in the morning, and didn't even think of packing them in my hydration vest, but it did get very cold there! 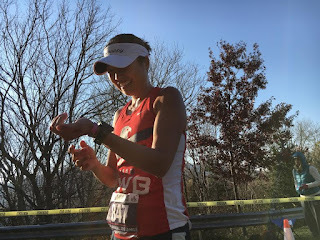 I wasn't moving fast enough to keep myself warm, so the best I could do was pull my visor down as low as possible (I was afraid it was going to blow off my head) and keep shuffling on autopilot towards the finish line. With 4 miles to go, I thought of my little dog Aero, who had just turned a year old. We go on 4-mile puppy runs together. With 3 miles to go, "that's just a little 5k." And with 2 miles to go, "I used to race the 2-mile on track in high school. Just 8 laps around the track!" Although in high school, the 2-mile seemed like the longest race ever! With one mile to go, we were back on the streets of Williamsport. 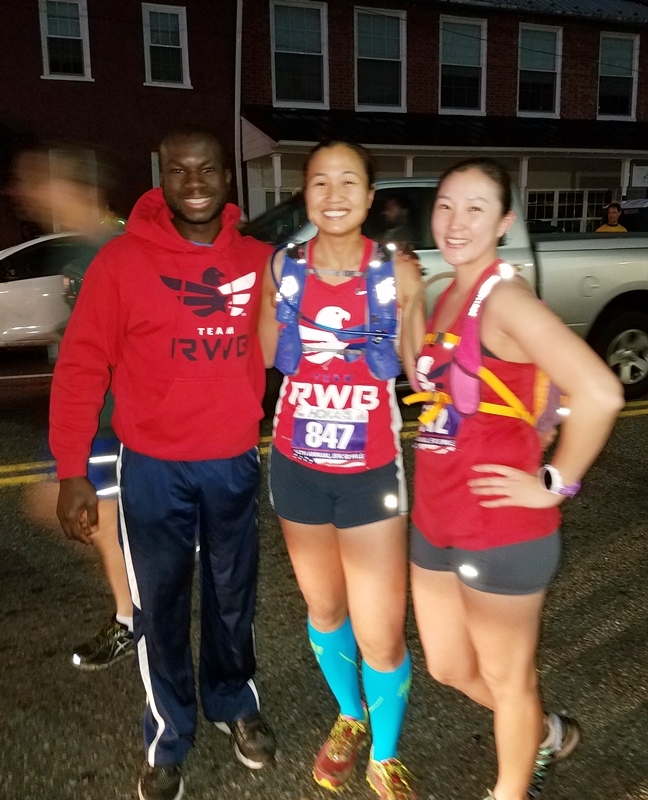 The race was extremely spread out by then, and I could see no one at all in sight, so I followed the line of traffic cones and at the intersections, the local cop cars had their lights on and gave me directions and encouragement. In the final stretch, I could see the race clock at the finish line with big red numbers, but there wasn't a big finish banner or anything, so I didn't really believe it was the actual finish until I was close enough to see Kevin, Caitlin, and Will jumping up and down cheering for me. I finally broke into a huge smile and sprinted through, seeing that the clock was still at 8-thirty-something! I ended up finishing in 8:37:18, and 18th female overall. We had a round of hugs and photos before they pushed me into the Springfield Middle School gym, because it was about to start hailing! My support crew got me warm, re-clothed, fed and rehydrated, then it was time for the awards ceremony. Even Malachi (Will's son) had come to congratulate me! Trying to avoid a quad cramping squat! I watched enviously as the top 10 women were being called up, and somehow it brought me back to 14 years ago... When I was 20 years old, I did my first Ironman as a solid mid-packer in 13 hours and change, and my mom had come to Wisconsin to watch me. I remember sitting next to her at the awards ceremony, watching my age group get called up and telling her "One day I'm going to go up on the stage for an award." She said "Of course you will. You can do anything." I never expected that eventually I would win my age group at races and later hit the podium as a professional triathlete. So you know...anything is possible! Emily appeared and we waited outside for our friends Ryan and Stacy to finish their first 50-miler too. They ended up finishing within seconds of each other! It was an amazing day full of accomplishment and camaraderie. 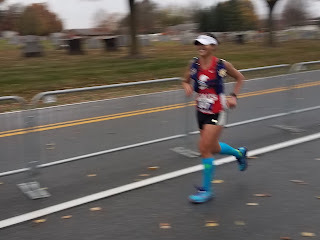 I'm so grateful to have been able to do as well as I did (realizing later I did not have any goals in between my A goal of "top 10/sub-8hrs" and my Z goal of "finish the race") and achieved my goals of NO CATASTROPHIC FALLS and staying mentally strong throughout the race. Sure there was that really tough stretch when my legs cramped up, but I was able to chill out, troubleshoot the issue with some help from Caitlin, and I was so happy that I finished really strong in the final 8 miles. Mostly I'm grateful that I was able to share the experience with some of my favorite people, which was the best part of the day! 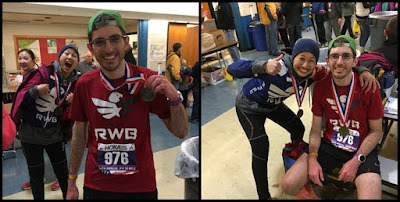 I don't get to see Will or Caitlin very often since we moved to Delaware almost 2 years ago; Emily and Ryan are the crazies who got me hooked onto this ultra madness; and best of all, Kevin is my finish line catcher for life (even if he grumbles about having to wait in bad weather). One of the reasons I signed up was it was 6 days before my 35th birthday, so this was my real 35th birthday celebration. It is now one week post-race, and I think my legs are finally working again and have forgiven me for all the punishment inflicted upon them. I had a ton of race goals I originally wanted to pursue "before I turned 35", but now that the birthday has come and gone (yesterday), I've realized that there is never a real deadline on race goals. I'm still getting faster and exploring new athletic endeavors that challenge me in different ways. I'm no longer interested in some of the things I used to obsess over. And I'm proud of the many things I have accomplished in my first 35 years of life, but I'm also looking very much forward to the new things I have yet to do. Happy Thanksgiving to everybody too! Photo credits: Will Reynolds, Caitlin Mahon, Emily Zaitz, Kevin Neill, Carlos Lopez and of course the official photographers H3 Photography! Love your blog! I had a lot of fun reading some of your old posts. I think what you've accomplished as a pro-triathlete is very impressive.